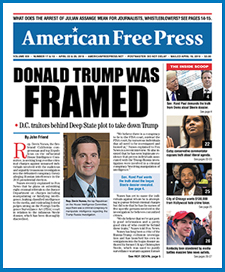 Right now, the team at AMERICAN FREE PRESS newspaper is in the process of assembling and editing a three-volume set of books, featuring hundreds and hundreds of Victor’s very best investigative reports on dozens and dozens of various topics—from energy scams to high-level governmental treason and everything in between. The three-volume set is estimated to be a total of 600 pages long, each book containing 200 pages of uncensored Victor Thorn! Simply called THORN, this amazing collection of old-fashioned, hard-hitting investigative reporting is how we make Hillary and Bill (and every enemy of the truth) stop their celebration and start quaking again at the mention of Victor Thorn. Click HERE to view the new website created by AMERICAN FREE PRESS that gives you all of the details.